July, 2002; Toy Trucker & Contractor , by Larry Phillips: A while back when Code 3 Collectibles released its replica of Chicago Engine 78 (an HME/Luverne pumper), along with a fully assembled model of its respective firehouse, I also learned that someone had written a pretty good book about CFD’s actual Engine Company 78 and the firehouse itself. It was called, A Chicago Firehouse…Stories of Wrigleyville’s Engine 78 . It also turns out that the author of the book, Karen Kruse, is a direct descendant of three generations of Chicago firefighters. Ironically, she is also the daughter of Chicago FD Captain Robert F. Kruse, a 30-year veteran of the CFD who spent half of those years at Engine 78. Once I got into the book I just couldn’t put it down. The author’s words literally became my eyes and imagination: off we went together into a Chicago neighborhood that, after finishing the book, I felt as if I could almost act as a tour guide through for anyone else that would like to visit there. Karen writes that Wrigley Field “is, literally, out the door and across Waveland Avenue from the front door of the firehouse.” Wrigley Field was built in 1914; the firehouse was built in 1915. Karen is the sort of writer that puts herself in every word and helps you along to relive the experiences that taught her respect not only for her father but for the entire fire service as well. I cannot recommend a book any more highly than this one. Yes, you’ll see photographs of Code 3 Collectibles’ “real” pumper, as well as apparatus and fire scene photographs of days long passed by. The book is published by Arcadia Publishing, and should be available from your local or favorite bookseller. October, 2003; 1st Responder Newspapers , by John Malecky: A CHICAGO FIREHOUSE (STORIES OF WRIGLEYVILLE'S ENGINE 78): This is a soft covered book measuring 6 1/2 inches by 9 1/4 inches and has 128 pages. The Forward is written by Mike Ditka, former player and head coach of the Chicago Bears. The pictures are all black and white... but the chapters are all colorfully written! That's the best way I can describe this little book, written as a tribute to a fireman father by a loving daughter. It is also a tribute to a unique firehouse, located across the street from the entrance of Wrigley Field, home of the Chicago Bears football team and the Chicago Cubs baseball team. The author's father entered the Chicago Fire Department back in the '60's when she was just a little tot. He was her hero then and he's her hero now. He retired in 1986 as a captain, but within his 30 years of service, 14 of them were at Engine 78. The book focuses on a brief history of Chicago, the fire department, the physical structure of the firehouse, the apparatus and the crews. It is a well rounded book. You may not believe how small the city of Chicago was at the time of "The Great Chicago Fire!" After the introduction, there are 10 chapters: The Lakeview Fire Department, A Civilian's Guide to the CFD, A Tour of Engine 78, It's All About Pride, Leather Lungs and Brass Fittings, Angels and Awards, Historic Cemeteries and the CFD, In the Shadow of Wrigley Field, Famous Neighbors and Landmarks and An American Family. If you are not too familiar with the CFD or for that matter Chicago itself, this book will fill you in nicely. Did you know that all CFD apparatus have a red and green steady burning light (port and starboard) in addition to their compliment of warning lights. The book will tell you why. It will explain the code system of dispatching, how the hydrants are operated and why they were called "fire plugs", how the street addresses are coded,why firefighters wear the Maltese Cross, the history of fire marks and fire patrols, why the fire academy is significant to Chicago and why fire codes changed. A brief tour of Engine 78, goes over the architecture of the station, the layout of it (officers do not have privacy), and other particulars. There are a number of heroic stories of fires, rescues and other calls handled by the leather lunged men of Engine 78 and the CFD. For much of the time that Captain Kruse worked in the CFD masks were not common. In fact, in the earlier days, the engine didn't even have a water tank. The cemetery chapter names some very notable people buried in two cemeteries that are reviewed. These cemeteries also have historic graves of firefighters killed in the line of duty, and also some memorials. The book would not be complete without a chapter about Wrigley Field, a unique field in itself! A history of it is covered here along with a picture of a hot dog stand on fire being extinguished by the author's dad of Engine 78. The last chapter gives the reader an insight into how one family developed their routine around the crazy working schedule of a firefighter. This is a nice book that has short chapters, alot of pictures and much information that you may or may not have known, but nevertheless amounts to interesting trivia. The website has links to major book stores who also carry the book and it is additionally available from FSP Books & Videos at 1-800-522-8528. 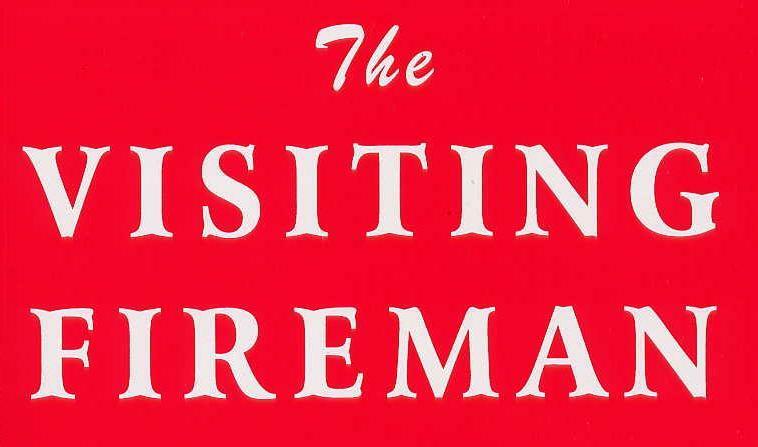 2003, 49th Edition; The Visiting Fireman , by Jeff Schielke: A CHICAGO FIREHOUSE (STORIES OF WRIGLEYVILLE'S ENGINE 78): A new and unique viewpoint by Karen Kruse of life inside one of Chicago's most legendary firehouses (Eng. 78 whose station is located directly across the street from the home of the Chicago Cubs baseball team). Much of the book is written to honor the author's dad, retired Captain Robert F. Kruse, who served the Chicago Fire Department for 30 years, half of those at Engine 78's house. Featured throughout the 128 page, soft cover text, are numerous black and white photographs depicting firehouse life as well as memorable events such as the famous Chicago Fire Department Thrill Shows, which the department staged before the public at Chicago's historic Soldier Field in the early 1960's. Also, included are some brief but fascinating historical anecdotes about the neighborhood within Eng. 78's "still district." What comes out in the book's well written text is a sense of the numerous memories and traditions which three generations of the author's family have given to the Chicago Fire Department. This volume offers a different approach to reporting on the American fire service and it is refreshing and enlightening to read and react to. This work can generally be ordered through major book stores as it is part of the Voices of America Series by Arcadia Publishing. It can also be ordered directly from the author at her website. Sunday, September 9, 2001; Chicago Tribune : Karen Kruse calls it the "family business": firefighting. For 14 years her father served with Engine 78, which is, undoubtedly, the most famous Fire Department rig in all of Chicago, thanks to its location just beyond the left-field ivy of Wrigley Field. Kruse's book is the meticulously researched story of 78, its long history (dating back to 1884) and its firefighters. The story is told through numerous anecdotes and vintage photographs from the point of view of a woman who grew up amid this tight-knit community. The story explores the people and the tragedies surrounding 78, and even tells the legend of how the old rig got its number. While the book can sometimes wax too didactic, too detailed, it is the author's own personal attachment to this storied firetruck and firehouse that makes this a great read for anyone interested in Chicago lore. Sunday, November 4, 2001; Chicago Sun-Times , by Henry Kisor: A Chicago Firehouse: Stories of Wrigleyville's Engine 78, by Karen Kruse (Arcadia, $19.99 paperback). This one is a true labor of love, for its author is the daughter of a Chicago fire captain who spent half his 30-year career at Engine Co. 78 on Waveland Ave. across from Wrigley Field, and the granddaughter of a 21-year veteran of Truck Co. 44 at 2718 N. Halsted. The author offers many fascinating tidbits of history from the creation of Chicago's fire department to the origin of such terms as "fireplug." To get water in the 1840s and 1850s, firefighters bored holes in pine underground water lines, afterward sealing the breaches with wooden plugs. There is a brief tour of the 1915 firehouse to which Engine 78 belongs, complete with some of the recipes favored by its cooks, and many anecdotes about the fires and disasters the engine company responded to, including bowling alley blazes, especially dangerous because of toxic fumes from the varnish on the wooden lanes. This book is slightly padded with gratuitous chapters on Graceland Cemetery, Wrigley Field and other landmarks that have little to do with firefighting, although they are in Engine 78's Lake View neighborhood. Still, the tales are charming and the pictures captivating, especially an old newspaper shot of the author's father putting out a fierce fire in a hot dog vendor's cart at the ballpark. Illustrated local histories like these normally sell to a tiny audience limited to the cities or even the neighborhoods they are about, but A Chicago Firehouse ought to find a broad readership, thanks in part to its author's pleasant and unpretentious storytelling style, and in part to the heroism of another place and another time -- that of the FDNY of Sept. 11. It will make a great Christmas present...It's really a great book, rich in history...The pictures of the firehouse are like a virtual tour...you did these guys proud...Everybody should get this book... ...Nick Digilio, WGN Radio, 720 AM, during live, 70-minute interview with Karen in the "Showcase Studio" in the Tribune Tower on Michigan Avenue, November 25, 2001. To listen to a portion of Karen's interview with Nick, click on the WGN Radio icon, then once at the site on Karen's name. Great work on Engine Co. 78... ...Jay Reardon, Chief of Northbrook (IL) Fire Dept. A book to consider... ...Chicago Fire Dept. Sounder , June, 2001. Karen has done for Engine 78 what Dennis Smith did for Engine 92 of New York. ...Larry Phillips, staff writer, Toy Trucker & Contractor . A great book...This is a very readable book, with superb photos, and will please not only Chicago FD buffs, but should appeal to all fire buffs. ... Fire Collector News June, 2001. Nobody since the Brothers Grimm has "Once upon a time" been handled as well... ...Patrick Butler, president of the Ravenswood/Lakeview Historical Assn. and Staff reporter for Lakeview's The Booster . I was extremely moved by your obvious love and respect for your dad and his profession... I was moved to tears more than once not necessarily in a sad way but more as an inspirational way. ...Roxanne Aehl, member of the Wisconsin Regional Writers Assn. Very impressive... ...Retired Capt. Larry McCarty, Western Springs Fire Dept. A book every firefighter's family should have. ...Connie Wright, FD chief's wife for 24 years and mother of 3 firefighters, Greenup,IL. Loved it! Didn't drop it til I ran out of book. ...Kris Hamermehl, Helicopter reporter with WBBM, Channel 2 News in Chicago. Interesting and enjoyable... ...Gregg Kruse, photographer, Iowa City Fire Dept. A great piece of Chicago Fire Department history. This was a well written book about a historic engine company of the Chicago Fire Department. The author's father was a member of that company during his career with the CFD. There are quite a few accounts of the fires and other incidents the firemen of Engine 78 responded to in that time frame. Not all the incidents are major but all were very interesting and detailed. Having read a large number of firematic books over the years , it compares very favorably to most if not all first efforts. Although Ms. Kruse was not a member of the fire service herself , she was able to convey the facts in a manner that both a novice and a veteran of fire departments could easily follow... ...Kevin O'Brien of So. Dartmouth, MA, as reviewed on Amazon.com, April 27, 2004. I loved reading what to me was a love story from a proud daughter to her fireman father. The information that is packed into this small book knows no boundaries and Karen has made the stories come alive with her knowledge and her ability to put these words on paper. The reader is put in the midst of some of Chicago's worst fires through the use of pictures and words. To anyone who grew up in the Wrigleyville area, this book is priceless. ... ...Betty, as reviewed on Amazon.com, July 6, 2001. A great first effort. Having read many firematic related books in over 30 years of being both a fire buff and volunteer salvage squad member, I can tell other readers this is a must have. It details the history of a CFD company that protects the Wrigleyville section of Chicago. It also tells of the story of how the activities of a company aren't always newsworthy , but can always be quite interesting. Ms. Kruse used first hand knowledge of the CFD from her father, a retired member of the same company to create an easy to read journal of it's history..... ...Kevin O'Brien, a pharmacist and fire buff, as reviewed on B&N.com, April 30, 2004. All of us who have lived in Chicago our entire lives understand the need for our illustrious fire department. We have all seen those huge red trucks rushing through the streets of our great city to save another Chicagoan. This book shows us how it is done. The pictures are astounding and the story is heartwrenching. The author is the off spring of a long time Chicago fireman, who better to tell the story. This is a must have for all Chicagoans.... ...A professor at NEIU, as reviewed on B&N.com, July 5, 2001. Didn't want to put it down. Too often, history books are dry and uninteresting. This book, fortunately, is not one of those. The author weaves an engrossing tale of one of Chicago's firehouses and its relation to the Wrigleyville area of the city. She includes enough historical and technical details about the area, the firehouse and the Chicago Fire Department. She also does not require the reader to learn about fire department procedures to be able to understand the book. All technical terms are explained so someone without a firefighting background can easily understand them. This book is perfect for anyone interested in firefighting, Chicago history or anyone who enjoys a well written story. I recommend it highly... ...Jim Mason, as reviewed on B&N.com, May 24, 2001. Nominated for the Pulitzer Prize in History!